London’s largest airport and one of the world’s busiest air transport hubs, London Heathrow Airport is situated to the west of central London and is linked to the city via public transport and road networks. Our London Heathrow Airport guide provides all of the necessary information about the facility, including details of terminal services, public transport access and nearby accommodation options. From central London, take the westbound A4 and either continue to the airport site or turn onto the westbound M4 or A30, depending on the terminal. Terminals 2 and 3 can be reached via the M4 (junction 4) and A4, Terminal 4 is reached via the A30, and Terminal 5 can be accessed via the A30 and then the Southern Perimeter Road. All terminals are easily accessible from the M25, either from junction 14 (Terminals 4 and 5) or junction 15 (Terminals 2 and 3). The total drive time from central London to the airport is approximately 45 minutes, depending on the route and traffic levels. Terminals 2 and 3 are within walking distance of each other and are connected via underground walkways. Transfers between Terminals 2 and 3, Terminals 4 (journey time: 8 minutes) and 5 (journey time: 12 minutes) are free on the Heathrow Express train or shuttle bus. Bus:Numerous local buses (tel: +44 343 222 1234; www.tfl.gov.uk) stop at the central bus station (between Terminals 2 and 3) as well as at Terminals 4 and 5. At night, the N9 bus service operates to central London. Cash is not accepted on London buses, payment must be made with either contactless bank card or TFL Oyster Card. The standard single bus fare (any distance on the same bus) is £1.50. Coach:Coaches connect London Heathrow Airport to more than 500 destinations throughout the United Kingdom. National Express (tel: +44 871 781 8181; www.nationalexpress.com) is the major service provider. Taxi:London's licensed black cabs serve London Heathrow Airport and are available outside each terminal. Taxis can be booked in advance via Heathrow Taxis (tel: +44 560 367 9412; www.heathrowtaxis.org). The journey time to central London is around 60 minutes and the fare is approximately £80, depending on traffic conditions. Rail:The Heathrow Express (tel: +44 345 600 1515; www.heathrowexpress.com) non-stop train service links London Heathrow Airport to London Paddington Station every 15 minutes (journey time: 15-20 minutes; fare: £25). A cheaper option from Paddington is the twice-hourly Heathrow Connect (tel: +44 345 604 1515; www.heathrowconnect.com), which stops at intermediate stations (journey time: 25 minutes; fare: £10.30 single). For national rail travel information, contact the 24-hour National Rail Enquiries line (tel: +44 845 748 4950; www.nationalrail.co.uk). Underground:London Heathrow Airport is on the London Underground (tel: +44 343 222 1234; www.tfl.gov.uk) network. Separate stations for Terminals 2 and 3, Terminal 4 and Terminal 5 are located on the Piccadilly Line, which can take passengers into central London (journey time: 50 minutes; fare: £6.00 – discounted when using an Oyster Card or contactless debit card). There are numerous restaurants, bars, fast-food outlets, coffee shops, pubs and sandwich bars throughout London Heathrow Airport. These include caviar and seafood bars in all terminals and a restaurant run by celebrity chef Gordon Ramsey in Terminal 5. Left-luggage offices (tel: +44 20 8759 3344) can be found in each terminal, while lost property can be reclaimed from the Airport Lost Property Office (tel: +44 844 824 3115) in Terminal 3. Baggage trolleys are available free of charge in baggage reclaim and other key areas. Other facilities at London Heathrow Airport include multifaith prayer rooms in all terminals, a Christian chapel (between Terminals 2 and 3), showers (post-security in Terminals 3 and 4), spas (in Terminal 3 and Terminal 5) and an art gallery (Terminal 5). There are pharmacies in all terminals: the chemists in Terminal 5 dispense prescriptions. There are several airline, business and executive lounges in each terminal; but a larger number of lounges concentrate in Terminal 3 including No1 lounges which are open to all travellers for a fee. Extensive meeting and conference facilities are offered by the larger hotels in and around the airport, including the Sofitel London Heathrow (tel: +44 20 8757 7777; www.sofitel.com) at Terminal 5. Free Wi-Fi internet access is available throughout London Heathrow Airport; fixed internet terminals are also available. There is a post office in Terminal 3; postboxes and stamps are available in every terminal. Card- and coin-operated public telephones can be found in the main areas of each terminal and mobile telephone charging kiosks are located in the departure lounges. Special assistance (tel: +44 844 335 1801) is available for disabled passengers at various help points throughout the terminal buildings and car parks. Passengers requiring wheelchairs should contact the individual airlines prior to travel; porters are available to help with wheelchair and baggage assistance. There is a range of car parking options at London Heathrow Airport. Each terminal has its own short-stay car park: this option is recommended for stays of up to five hours. Long-stay car parks are offered by the airport as well as private operators, such as NCP (tel: +44 345 050 7080; www.ncp.co.uk) and from the Airport Parking site (www.airport-parking.org.uk) – these car parks are linked to the terminals by a courtesy shuttle bus. 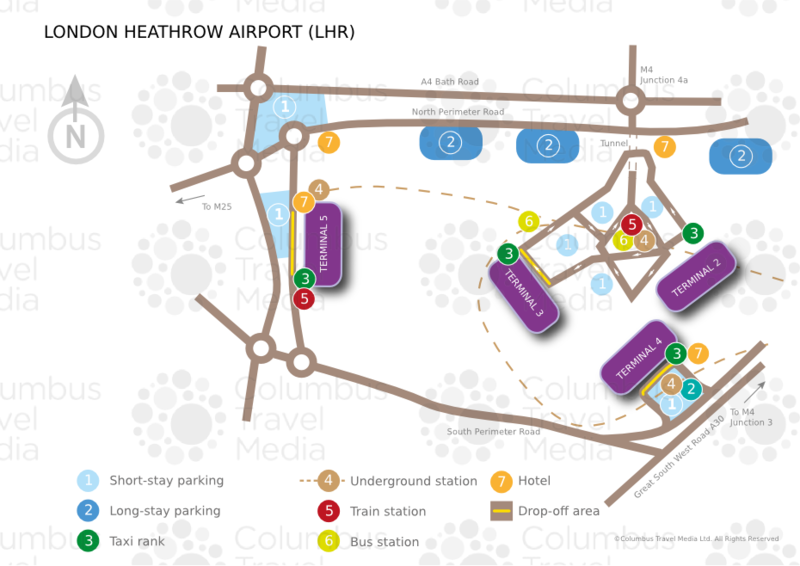 Bookings for short- and long-stay parking can be made via the airport website (tel: +44 344 335 1000; www.heathrowairport.com). Business and valet parking (which is available at each terminal) is also bookable through the airport's website. Motorbikes can park free of charge in designated areas at each terminal. Car hire companies represented at London Heathrow Airport include: Alamo, Avis, Budget, Europcar, Enterprise, Hertz, National and Sixt. Desks for these operators can be found on the arrivals level of each terminal.